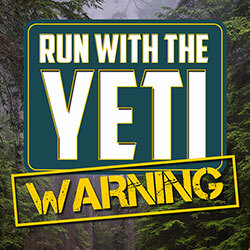 Run With The Yeti – a trail running event at Angel Mounds. Saturday, November 24th starting at 8am. Choose from 5K, 10K, 15K, Half Marathon, or Full Marathon (all ran on a 5K loop). 2-person relay option available for Half. 2- and 4- person relay options available for Full. Packet pickup starts one hour before race. Finisher medals for Half and Full Marathon participants. Long-sleeve, soft-style, black t-shirts for all participants.